TELL YOUR STORY. START YOUR FUTURE. It's simple. And free. And might just change your life. Think of it as an informative vacation on a 27,000-acre resort. We're just the right size (in our utterly unbiased opinion). At 2,100 students, the Berry community is big enough that you'll be constantly meeting new people but small enough that you'll be known and supported and heard. We'll get you ready — for anything. And everything. No matter your personal path or career destination (or whether you're undecided on either or both), each of our 42 majors and 38 minors equips you with knowledge, skills and habits of mind that prepare you for success in grad school or your first, second or seventh job after college. Berry’s programs in pre-med, pre-law and pre-veterinary science result in pleasingly high professional school acceptance rates. We have a clear plan that makes sure you get the best of the Berry education. It’s called the Berry Compact, and its principles of exchange and student ownership go back to our founding. We ask that you pitch in, share your ideas and use your learning for good. In return, we offer a top-flight education, extraordinary mentorship and professional development experiences that make your résumé sing and skills that turn heads at the interview. You will be challenged—and supported. Our coursework is rigorous. Our standards are high. But you’ll be free to take intellectual risks knowing you’re surrounded by advisors and guides. Our culture of people helping people is felt the moment you arrive on campus, and are paired with a faculty advisor and a student mentor. From professors, staff and peers to coaches and alumni, Berry people will give freely of their wisdom and experience, answering questions and opening doors. You will have guaranteed access to as many as eight semesters of paid professional development experience. Berry students help operate the college they call home, filling more than 1,000 jobs in all 180 departments through our signature LifeWorks program. Whether supervising a chemistry lab, overseeing a herd of angus cattle or running an on-campus startup, you will have guaranteed opportunities to log meaningful management experience while building the unshakable work ethic for which our graduates are known (and rewarded). You will reap the many benefits of learning and life on the world’s biggest campus. Berry’s 27,000 acres make it twice the size of the next largest college campus. 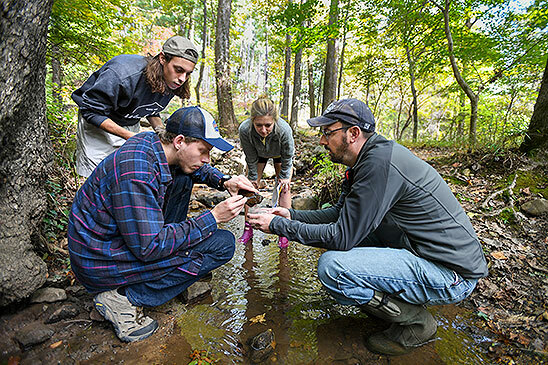 But the important story is what our students do with all that space—from field research across a variety of ecosystems to running entrepreneurial ventures to every conceivable form of outdoor recreation. We help make this experience affordable. Ensuring students from every financial background have access to the Berry education has been a priority since our founding. Through a combination of merit scholarships and need-based financial assistance, Berry helps lower college costs to manageable levels. We’ll also partner with your family in financial planning and offer payment plans to spread Berry costs throughout the year. You’ll be making the best possible investment in yourself. You’ll inherit a legacy of success. Our graduates do well for themselves. And they do good in the world. Because they have been pushed academically, they are careful and critical thinkers, able to solve complex problems. Because they have learned with their hands, they understand how ideas connect to action. Because they come of age in a community of support and respect, they know who they are. And where they are headed. And why they matter. But these are just words. What matters most is the way you feel when you step onto this campus, whether this is a place you’d want to call home for four years. And for the rest of your life. There’s one best way to figure it out.